I regularly receive requests for makeovers from women all over the world who often frustrated with their own efforts and are tired of wasting time and money but still feeling stuck. Since I know not everyone can be in Boston for a one-on-one consultation, a virtual makeup and hair makeover with me is the next best thing! Does it really make that much difference? Look at the examples below and you’ll see! 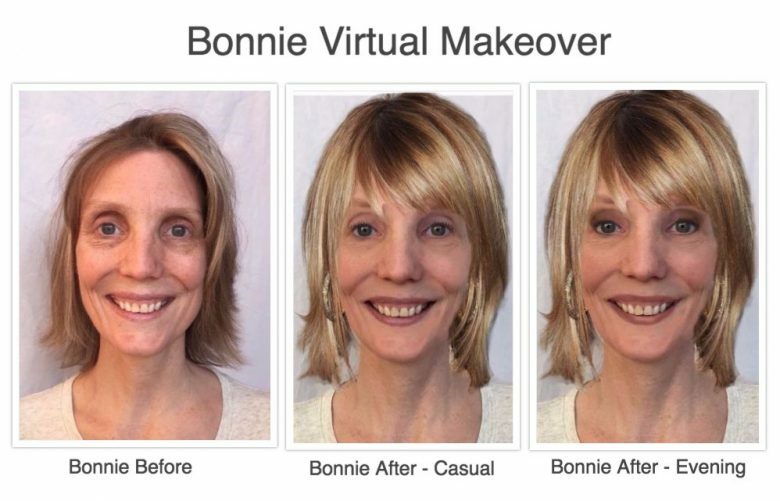 Bonnie has thick fine hair with a little bit of natural wave to it. As you can see, she has gorgeous eyes. Evening out her skin tone and brightening her eye area brings more focus to her eyes. Also, adding a bit more brightness to her hair and soft bangs balances her face and, again, helps us notice her eyes even more. “This is amazing!” – those were Jane’s words when she saw her makeover. Jane was wearing glasses in her before photo so, to make her eyes more visible for the makeup, I first removed the glasses (you might notice a faint discoloration where her glasses were). Of course, she can add her glasses after she’s done her makeup. I wanted to keep Jane’s hair short and fun (in keeping with her zesty personality), but change the color slightly to bring out her eyes. I also felt compelled to add a little drama by including a necklace. “I really like it!” is what Susan said about her makeover. Susan is very low maintenance and has great hair. It’s thick and wavy so there is lots with which to work. Her hair color is also her beautiful natural color. She generally does not wear makeup, so I didn’t want to add a lot because that wouldn’t suit her. She has rosacea so a touch of foundation to even out her skin tone helps to bring focus to her eyes. Accentuating her eyebrows frames her eyes as well. For her hair, I focused on keeping her natural waves but chose to part her hair on the side and give her side-swept bangs. This way we notice her eyes more and it all frames her face beautifully. With the use of a round brush and flat iron Sue can create a very sleek hairstyle that looks great on her and supports her natural elegance. The flat iron will also add extra shine to her hair, which brightens her face. I enhanced her makeup for a touch of glamour in her evening photo. With a virtual makeover you can see if you like the hairstyle BEFORE you bring an idea to your stylist or spend months waiting for your hair to grow. 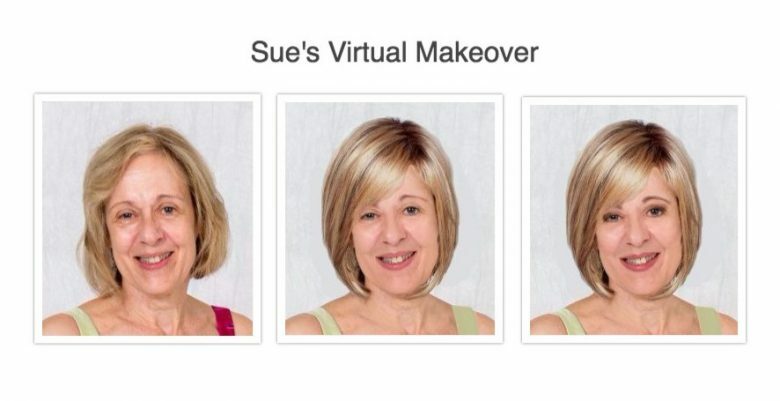 Order your Virtual Hair & Makeup Makeover for $199. Once you place your order, you’ll receive a brief questionnaire. As soon as I receive your answers, I’ll begin your makeover.